Escanaba Michigan was an important hunting ground for native peoples. Hunters came from long distances to reap the bounty that was found along these shores. Little Bay du Noc is named after the Noquet or Noc native people who lived in the immediate area. Escanaba was settled in the mid-19th century and became an important harbor for commercial shipping. The principal products then as now are iron ore and lumber products. Back in 1900, Escanaba was home port to a pirate on the Great Lakes too!! - Dan Seavey, whose larcenous activities included stealing cargo, poaching and various acts of mayhem. 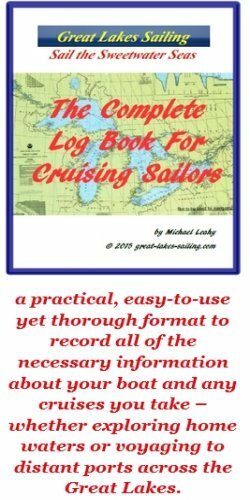 Today, Escanaba Michigan is not only a busy commercial port but also a destination for cruising sailors. The surrounding area is remote and beautiful. For the sailor who wants to leave the hustle and bustle of large cities behind, Little Bay du Noc is an ideal cruising ground and Escanaba a lovely port town to visit. The approaches to Escanaba Michigan are clear. There is significant shoaling out from the shoreline to the north and south of the entrance channel so it is prudent to stay 1-2 nm off. There is a Fl RED buoy (R8) located north of the harbor entrance and another Fl RED (R8) located south of the entrance. Stay to the east of these buoys until you are lined up with the entrance. A course of approximately 279°T will bring up the channel. When you enter, you will find and excellent, very well protected harbor. The channel entrance is on the south side of Sand Point, marked by the Sand Point Light - F RED visible 6.4 nm offshore. The Escanaba Light is 2 nm north of the channel entrance. It is an ISO WHITE, visible 7.8 nm with a horn. Also on the north side of the channel entrance, on the end of Sand Point is the GREEN & WHITE Escanabla Lighthouse (deactivated). South of Escanaba, there are local magnetic anomolies. Chart notes indicate variations up to 17°T so exercise caution. There is a lot of traffic to the commercial docks north of the Sand Point channel entrance so it is prudent to maintain a listening watch on VHF 16. Escanaba Municipal Marina has 165 slips with at least 4 dozen set aside for transient sailors. There is a fuel dock (diesel and gasoline) and pumpout station. Water and power are available at each slip. There are restrooms, showers and laundry facilities in the harbormaster's building. A ship's store carries basic supplies. There is internet service. The marina also has bicycle rentals if you want to explore the surrounding area. EYC uses the docks and facilities of the Escanaba Municipal Marina. Transient sailors are welcome to visit the club. There is a large kitchen, dining room and an outdoor deck with BBQ grills. Vinette Boat Works is operated by experienced boatbuilders and sailors. This yard can handle engines, mechanical, fibreglass and hull repairs & maintenance. Jim's South Side Grocery is about 1.6 mi/2.5 km from the harbor. Northern Michigan Bank & Trust, about .7 mi/1 km from the harbor, has counter and ATM service. St. Francis Hospital (906) 786-5707 is located about 2.8 mi/4.5 km from the harbor. The Medicine Shoppe (906) 786-0131 is about 1 mi/ 1.6 km west of the marina. Escanaba Michigan has a number of nice restaurants and pubs to enjoy. The House of Ludington is a restored hotel that first opened its doors in 1865. This historical landmark houses a top-notch restaurant. Down the street is Hereford & Hops, a well-regarded brewpub. The Swedish Pantry offers a full range of delicious Swedish dishes. For a taste of Italy, stop into Crispigna's for some good home-made Italian food. Further out of town is the Stonehouse Restaurant with a casual dining room (steaks, ribs, seafood) and a lounge with an extensive wine list. Little Bay du Noc hosts a number of fishing tournaments. The Krusin' Klassic Auto Show takes place each year at the end of June. July sees the National Trapper Association come to town with its convention and Outdoor Exposition. In August, there is the UP State Fair and the Steam & Gas Show Throughout the summer ther are a variety of concerts. The William Bonifas Fine Arts Center hosts a number of performing arts events including the Waterfront Art Festival. Check out the Sand Point Lighthouse, constructed in 1867. The Escanaba Michigan visitors site will give you an idea of lots more things to do and see while visiting the area.